Want to revisit the 80s? 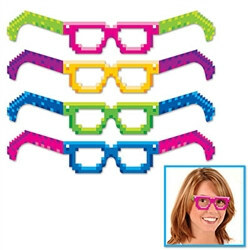 Check out these 8-Bit Eyeglasses. Each pair of eyeglasses are printed on cardstock material and come four (4) per package. Each pair being a different color; Pink, Blue, Green and Yellow. We also sell several different 80s and 8-Bit party supplies.